Is Walking 30 Minutes a Day Enough? The benefits of regular exercise are well documented. According to the Surgeon General Executive Summary on Physical Activity and Health, higher levels of physical activity are linked to lower overall mortality rates, decreased risk of cardiovascular disease, prevention or delay of high blood pressure with aging, decreased risk of colon cancer, lower risk of diabetes, lower risk of obesity, and improved mental health. Other benefits include better sleep, improved brain function and increased aerobic capacity. 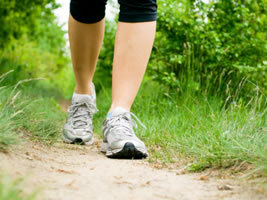 Regular walking at just a moderate pace is a fabulous way to improve your fitness. It is cheap, convenient, low impact, not too difficult, and can easily be broken down into 2 or 3 sessions a day if you do not have time to get it in all at once. Is 30 minutes of walking a day at a moderate pace enough? Walking by itself is obviously great exercise, and yes, 30 minutes a day is enough to provide significant health benefits. However, there may be a difference in health benefits depending upon how fit you are based on aerobic capacity. According to an article in the Sept-Oct 2006 issue of American College of Sports Medicine Health & Fitness Journal written by David Swain, PhD., a professor of exercise physiology at Old Dominion University, most regular exercisers have a 30% reduction in coronary artery disease risk over sedentary people, but those with the highest aerobic capacity have more than double the protection against heart disease. Aerobic capacity is boosted by increasing the intensity of some workouts. If you want to see continued improvement, then go ahead and gradually introduce something a little more intense just once or twice a week. A good way to start is to try adding several 1 minute jogs or a power-walking gait to your usual walk. Other options would be to find a hill to walk up or head to the gym for a short hard easy bike or stairmaster workout. The idea is to elevate your heart rate to a level above what you are accustomed to for short periods of time with alternating recovery breaks. Chances are good you will begin seeing improvements after just a few of these higher intensity workouts. You can gradually continue the progression by increasing the length of each quality interval until you are able to continually exercise at a higher intensity. Remember, you only need to do this once or twice a week to raise aerobic capacity. Increasing exercise intensity is not recommended for everybody. For example, the presence of cardiovascular disease risk factors such as smoking, age over 40 years, diabetes, family history of early heart disease, high blood pressure, and abnormal blood lipids is a major concern. If you have 2 or more of these risk factors there is a greater chance that you may already have some degree of coronary artery disease, and exercising harder puts you at much greater risk for cardiac problems. Perhaps you heard about the recent death that occurred during the Marine Corps Marathon. Another concern would be exercise compliance. Not everyone enjoys higher intensity workouts, and if you hate what you are doing, the next thing you know is you'll be looking for excuses to skip workouts. If that is the case, you are better off keeping the pace slower and more comfortable. Remember, if you already have 2 or more of those cardiac risk factors, play it safe and get checked out by a physician. It's not worth the risk. are also mentioning it in the Microsoft file that you will send me when I pay you for the writing work. Evidence now suggests that friends may also offer physical health benefits.